One of the things I’ve enjoyed about this series is the way Miyazono has weaved in a strong sense of impending doom as Askuka and Ryu get closer. Their ultimate goals are so opposed, there’s no way a long-term relationship will work out without one of them significantly changing. This adds an additional level of emotional complexity to this josei romance manga. While Asuka and Ryu have moved in together, he then decides to accept a news posting in the United States. They embark on a long distance relationship where they occasionally see each other for a weekend, but keep spending more time on their careers. It is almost like the universe is conspiring to keep them separate. Asuka ends up suffering a pretty big career setback when someone hears her breezily discussing her ultimate goal of becoming a wife and homemaker, and Ryu continues to become more and more busy as a news reporter. As Asuka keeps getting disappointed by her relationship and her career, Kamiya is there to offer up some companionship while Ryu is overseas. Towards the end of the volume though, it is Asuka who finally gets herself together to start making some changes in a somewhat roundabout way. 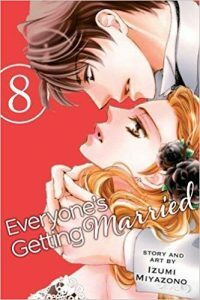 Everyone’s Getting Married is a josei series with a surprising amount of emotional depth. If a happy ending does happen for this couple, it will not be an easy path, and that’s why this series continues to be so interesting.